Coming July 1-23, 2017. Who will win the yellow jersey this year? Yes, it’s that time of year with the Tour de France in full swing now with lots of excitement and competition. The Tour de France is the oldest and considered the most prestigious of cycling’s Grand Tours, composed of last month’s Giro d’Italia (won by the Netherlands’ Tom Dumoulin) and August’s Vuelta a España. 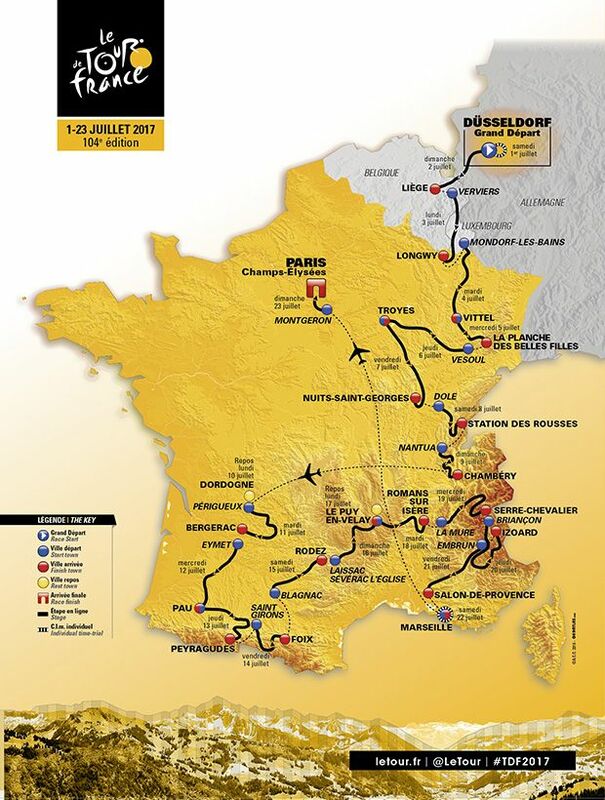 Each year the route changes, however the format always consists of 21 day-long segments (stages), 2 rest days, around 3,500 kilometres (2,200 mi), and alternates between clockwise and counterclockwise circuits, ending on the Champs-Élysées in Paris. This year, with slick roads and aggressive riders, there have been some serious injuries, so keep an eye on out for who will be rewarded with the maillot jaune in 2017!